Starring: Ty Burrell, Max Charles, Ariel Winter, Lauri Fraser, Guillaume Aretos, Allison Janney, Zach Callison, Stanley Tucci, Patrick Warburton, Mel Brooks, Steve Valentine, Stephen Colbert, Leslie Mann, and more. 1) Voice Acting - Total Thumbs Up: Dreamwork's casting for this film was outstanding. Ty Burrell had just the right voice for Mr. Peabody. Max Charles was adorable as Sherman. Ariel Winter showed her lovely range as Penny. Allison Janney made her character glow with malicious evil. 2) Artwork/Animation - Total Thumbs Up: Dreamworks always pays a great amount of attention to detail, and their work on "Mr. Peabody and Sherman" was no exception. Their renderings of the historical locations they traveled to were exquisite. Mr. Peabody's lab, the time tunnel, the WABAC itself all looked amazing. What was even more fun, however, were the bits in the art that seemed to be paying homage to other films or shows - the giant statues in the sphinx shaped like cobras, the WABAC's interior looking a lot like the bridge of the 1960's "Star Trek", a couple of other spots mirroring scenes from "Dr. Who". That they included art bits in the ending credits of the original "Peabody's Improvable History" was a perfect touch. This was definitely a work of love. 3) Plot/Story - Total Thumbs Up: "Mr. Peabody and Sherman" is based on a 1959-1964 segment which appeared as part of the "Rocky and His Friends" and "The Bullwinkle Show" called "Peabody's Improbable History". The main points in the original segments were how the two of them would travel to important points in history and the off the wall way they would make things work out, and that all would eventually revolve around a pun or two. These traditions were definitely kept in the film. 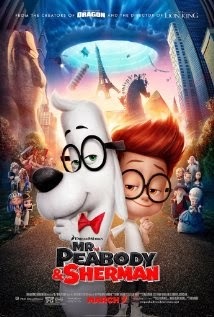 What's most impressive about "Mr. Peabody and Sherman' is how Dreamworks took this bizarre concept of a genius dog and his adopted son who travel in time and infused it with real parent and children relationship issues, as well as several current topics pertaining to education and other agencies. Mr. Peabody may be the most accomplished dog or human of his day, but parenting doesn't always work as straightforward as science. I think many parents will resonate with the trials and feelings Mr. Peabody showed. Puns and wordplay, as well as visual gags, are everywhere as well as an infusion of serious topics for parents and children alike to contemplate. There's even history to learn as many important events get explored, all seeded with accurate information as well as the 'not so much' kind the original segment was famous for. 4) Music - Total Thumbs Up: Danny Elfman did some marvelous music work on this film. While it carries his unique signature, it also lent itself quite engagingly to each of the times the group visits. Even better, there were riffs scattered here and there from other films and shows - "Stargate", "Lawrence of Arabia", and "The Matrix" to name a few. Conclusion: "Mr. Peabody and Sherman" is a fun film. It gave homage to the original as well as to many other science fiction shows and did so verbally, visually, and even musically. It is a fan paradise for bits of homage, in-jokes, as well as nostalgia. Yet, the fast plot and smart script will keep both adults and kids thoroughly entertained. The short before the film called "Almost Home" is hilarious.